Ansonia Clock Co., Royal Bonn case, the "Anchor", ca 1901. A porcelain case marked "Royal Bonn", and the name "Anchor", on the back. 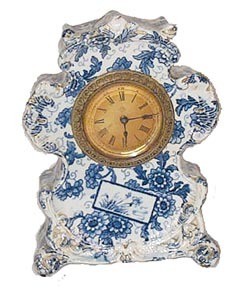 Made in Blue Delft, a style highly collectable in the eastern states. Movement is 1 day, back wind, running but sluggish. Needs cleaning and oiling. The case is dirty in the crevices, soap and water will do wonders. 2 inch dial, beveled glass, gilt sash. Ly-Ansonia No.2493, No.2496.